WASHINGTON, DC — The American Hellenic Institute (AHI) hosted its 43rd Anniversary Hellenic Heritage Achievement and National Public Service Awards Dinner, March 3, 2018, Capital Hilton, Washington, D.C.
Phil Angelides, former California State Treasurer, former Chairman of the U.S. Financial Crisis Inquiry Commission, and Businessman. Larry Michael, “Voice of the Redskins,” and chief content officer and senior vice president, Washington Redskins; was the evening’s emcee. AHI Board of Directors Member Leon Andris introduced Michael. 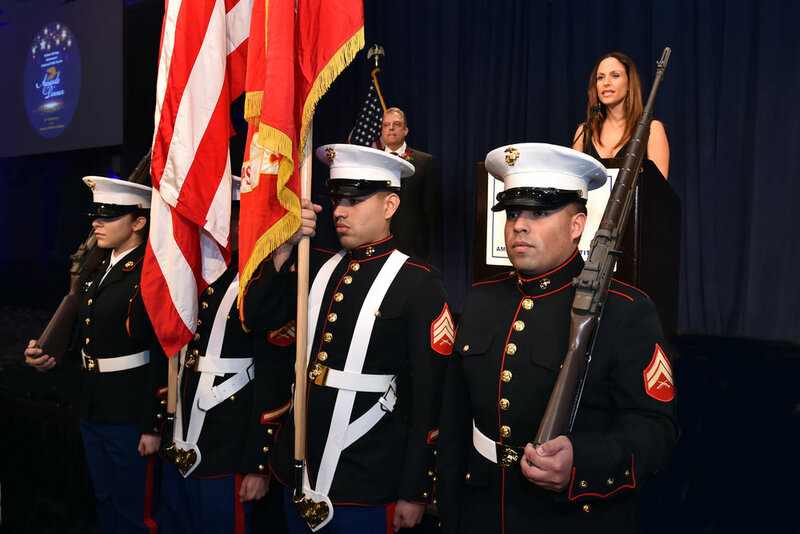 The Marines of Headquarters Battalion presented the colors and the American and Greek national anthems were performed by Maria Pearce. His Eminence Metropolitan Gerasimos of San Francisco, assisted by Reverend Konstantinos Pavlakos, Saint Katherine Greek Orthodox Church, Falls Church, VA, offered the invocation and benediction. Apollonia provided musical entertainment. Deputy Assistant Secretary of State for Europe and Eurasia Jonathan Cohen opened the evening’s program with a special presentation, “U.S. : Honored Country—2018 Thessaloniki International Fair.” Following the presentation, AHI Foundation President Constantine Galanis and AHI President Nick R. Larigakis, offered greetings. They also reviewed the initiatives and programs AHI and AHIF provide the community. In addition, the evening’s program featured a reflective presentation piece that commemorated the ten-year mark of the AHI Foundation’s Foreign Policy Student Trip to Greece and Cyprus program by program alumni Constance Douris, vice president, Lexington Institute, and Elias Gerasoulis, who is enrolled at the University of Pennsylvania. Nancy Papaioannou received the AHI Hellenic Heritage Achievement Award in recognition of her tireless championing of the Greek and Cypriot communities in her professional and personal life. She serves as the President of the Atlantic Bank of New York, an affiliate of New York City Group of Banks since July 2013. She holds the distinction of being the first Greek-American female to serve as President of a bank in the United States. Under her leadership, Atlantic Bank has grown to be the biggest Greek-American banking institution in the United States. She has demonstrated her community leadership as now Chairman of the Hellenic American Chamber of Commerce, Board Member of Mount Sinai Queens Hospital and National Hellenic Society Board of Directors, an has been appointed Chairwoman of the 2018 Greek Independence Parade in New York, the largest such parade outside of Greece. “Every year that passed, made me realize more and more the amazing fact that a smaller Greece exists in the United States, in every city, in every state. This Greek American community serves our values, our traditions, our religion,” Papaioannou stated. 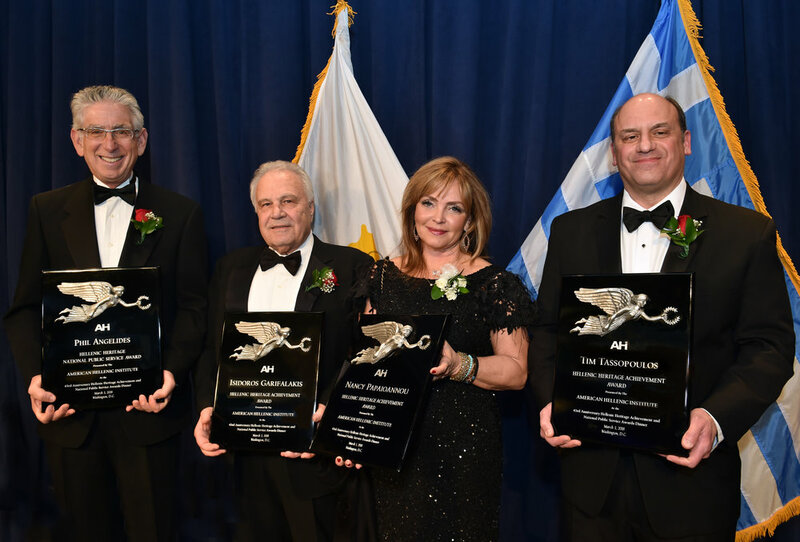 Businessman and Philanthropist Isidoros Garifalakis received the AHI Hellenic Heritage Achievement Award in recognition of his passionate commitment to integrity and honesty in business, philanthropic achievements, and his support of Orthodoxy. In acceptance, Garifalakis stated he was “overwhelmed” with the love and affection shown to him and that words could not express his gratitude for being selected for this honor by AHI. He added he shares the honor with his family, for which he is grateful; and he shares it with the many ministries of his Faith. Garifalakis also referenced the recent Winter Olympic Games and the commitment to hard work of the Olympic athletes, and the legacy of the Games, which embody the Hellenic spirit. Tim Tassopoulos received the AHI Hellenic Heritage Achievement Award for his visionary leadership in business and fidelity to Orthodoxy and youth. Tassopoulos is the President and Chief Operating Officer of Chick-fil-A, Incorporated, where he first began working as an hourly restaurant team member nearly 40 years ago. He also credited AHI and AHI President Nick Larigakis for providing a terrific impact upon young Greek American students through the AHIF Foreign Policy Student Trip to Greece and Cyprus program, on which Tassopoulos’ son, participated. Phil Angelides received the AHI Hellenic Heritage National Public Service Award for his innovate work in affordable housing, urban planning and redevelopment and infrastructure investment in smart growth communities. He has served his community as Chairman of the California Democratic Party, California State Treasurer, and Chairman of the U.S. Financial Crisis Inquiry Commission. Angelides now serves as President of Riverview Capital Investments which focuses on clean energy projects and sustainable urban development. The honorees’ many accomplishments were celebrated throughout the evening and highlighted in congratulatory letters submitted to AHI from His Eminence Archbishop Demetrios, Geron of America; Ambassador of Greece to the United States Haris Lalacos and Charge d’Affairs Andreas Nikolaides, Embassy of the Republic of Cyprus. Special thank you to our Major Benefactors: Mr. & Mrs. Isidoros Garifalakis, Mr. & Mrs. Tim Tassopoulos, Anonymous, Mr. & Mrs. Gust Andy, Mr. & Mrs. Constantine Galanis, Mr. & Mrs. James H. Lagos, Mr. & Mrs. James Pedas, Mr. & Mrs. Theodore Pedas, Gerry & Jeannie Ranglas, Mr. & Mrs. Gene Rossides, Drs. Spiro & Emily Spireas, Mrs. & Mrs. Angelo Tsakopoulos. Special guests attending the event included: Ambassador of Greece to the United States Haris Lalacos, Deputy Assistant Secretary of State for Europe and Eurasia Jonathan Cohen; Charge d’Affairs Andreas Nikolaides, Embassy of the Republic of Cyprus; former American Ambassador to Greece Thomas Miller, former U.S. Senator Paul S. Sarbanes, U.S. Representative John Sarbanes, His Eminence Metropolitan Gerasimos of San Francisco, AHEPA Supreme President Carl R. Hollister, AHI Founder and former AHI Foundation President Eugene Rossides, former Minister of Greece for Citizen Protection Christos Papoutsis, Former State Representative of Georgia Mike Cheokas, Col. Panagiotis Kavidopoulos, Defense Attaché, Embassy of Greece; Commander Demetries Grimes, congressional candidate, 26th Congressional District of Florida. Other notable guests attending the dinner were: Art Dimopoulos, executive director, National Hellenic Society; Mike Manatos, executive director, OXI Day Foundation; Paul Kotrotsios, publisher, Hellenic News of America and president, Hermes Expo International; AHI-Athens Chapter Members George Mermelas, Katerina Papathanasiou, Gregory Kanakaris, and Rear Admiral Vasileios Kyriazis, retired Hellenic Navy; Rev. Father Paul Paris, presiding priest, Holy Trinity Greek Orthodox Cathedral, Portland, Ore.
Former AHI honorees at the dinner included: Former Senator Paul Sarbanes, U.S. Representative John Sarbanes; Ambassador Thomas Miller, Dr. Christine Warnke, AHI Founder Eugene Rossides, AHEPA Executive Director Basil N. Mossaidis, Manny Rouvelas, Larry Michael, Voice of the Redskins; and Rena Papapostolou. Notable members of the Press attending the dinner were: Lena Argiri, Washington DC correspondent, Greek Public TV; Petros Kasfikis, Washington DC correspondent, AMNA News; Paul Kotrotsios, publisher, Hellenic News of America; and CosmosPhilly. As part of the weekend’s festivities AHI hosted a breakfast briefing with Ambassador of Greece to the U.S. Haris Lalacos and Charge d’Affairs Andreas Nikolaides, Embassy of the Republic of Cyprus, on March 3. The relevant topics affecting both countries were discussed by the two top diplomats. AHI President Nick Larigakis moderated the discussion. A lively Q&A session followed. Moreover, as part of the weekend’s festivities, AHI hosted a Greek Night at Kellari Restaurant, the evening before the Gala, March 2nd.